It can be tough to get going without your morning coffee – even if you’re a goat. That’s what workers at a Starbucks in Rohnert Park, California, found out when they opened the doors for business on Sunday morning and a goat barged in and ordered herself a cappuccino. Just kidding: The goat chewed on some boxes. Which is pretty dumb, goat. Boxes don’t have any caffeine. According to the Santa Rosa’s The Press Democrat, police responded to the Starbucks around 5 am when employees of the coffee chain pointed out the goat in question. 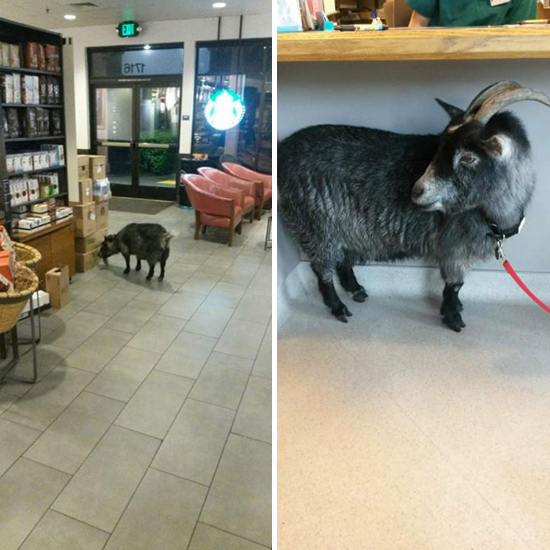 “It’s not every day a goat walks into a Starbucks,” Rohnert Park police Sgt. Rick Bates was quoted as saying. “The two girls were opening for business. ... They tried to give the goat a banana, but it walked right past them.” Let this be a lesson to Starbucks employees everywhere: You can’t distract a goat with a banana. They might want to consider adding that to the employee manual. Just in case. Turns out the goat, who is named Milly, is a family pet who lives two doors down from the Starbucks. But if this goat was hoping to become a regular, she didn’t get the reception she expected—the goat was sent off to a local animal shelter before she was identified and brought back home. “We’re going to build a fence today so she doesn’t get away again,” said Alan Ergenbright, one of the goat’s owners. Yeah, that’s probably a good idea. Who knows how crazy this goat is going to get come Pumpkin Spice Latte season.